This is the project page of the Constrained Mixed-Integer Solver (short CoMISo) developed at the Computer Graphics Group of the RWTH Aachen University, which emerged from our Mixed-Integer Quadrangulation project. This software provides a convenient tool for setting up and solving linear systems stemming from quadratic energies subject to linear equality constraints as well as to integer constraints. Basically only the system matrix, the constraints and the variables to be rounded are provided to the solver which returns a properly indexed solution vector. This drastically minimizes the programmer's effort as a proper elimination of the constraints and the necessary reindexing is taken care of internally. The difference to popular constraining techniques such as Lagrangian Multipliers, which require no reindexning (but unfortunately result in larger, non-positive semidefinite systems), is that CoMISo efficiently eliminates the constraints from the system matrix, yielding a smaller system while at the same time preserving positive semidefiniteness. The solver together with example code to get you started can be found below. If you decide to use the CoMISo solver in your research, please cite the accompanying publication Practical Mixed-Integer Optimization for Geometry Processing. The CoMISo solver library is released under the GPL license, for commercial use contact Henrik Zimmer or David Bommes. Efficient re-solve of constrained systems! Re-solve constrained system using updated (system and/or constraint) right hand sides! sparse Cholesky (Cholmod, LDLT), SpareQR, TAUCS, UMFPACK and of course the interfaces for Constrained and Constrained Mixed-Integer Problems -- CoMISo! 19-05-2010 : Minor Memory Leak fixed in CholmodSolver.cc. Thanks Ashish Myles. to get the necessary packages. On Windows or Macintosh systems the corresponding packages usually need to be manually downloaded and installed. The CoMISo library can be built to be integrated with the OpenFlipper framework or as a stand-alone package. # mkdir build && cd build && cmake .. NOTE! : on some systems the SPQR library from SuiteSparse is not available as shared library libspqr.so by default and will cause linking problems. If you do not need it, it can be disabled by the flag SUITESPARSE_SPQR_VALID in the cmake interface. To get acquainted with the functionality of the solver, the example programs (/DIR/CoMISo/Examples/) are a good start. 1) The factored approach, BTBx=BTb. Here one supplies a, usually overdetermined, m x (n+1) row-matrix (B*|b_) with the rows being the m linear equations of the system, b0*x0+...+bn*xn=bn+1. The constraints are eliminated directly from the B*_ matrix before *BTB* is formed. 2) The quadratic approach, Ax=a. Here one supplies the n x n system matrix A=B*TB and the right hand-side a=BTb. I.e. the partial derivatives of the quadratic energy. Here the constraints are eliminated directly from the A*** matrix. Basically the difference consists in whether B*TB*** and the right hand-side are formed by the user or by the solver, and at what stage the constraints are eliminated. Both solver approaches and other functions of the library are demonstrated in the examples. The provided examples (above) already demonstrate the basic functionality of the solver and how to write applications using it. a demo application utilizing the CoMISo solver. The Plugin sets up a simple Laplace equation system on an input mesh (with boundaries). To demonstrate the constraint-elimination, the vertices on each boundary of the mesh are constrained to have the same value. Furthermore, to shown simple linear constraints, the boundaries are constrained to have values differing by 5. Integer constraints can be added by selecting vertices of the mesh. 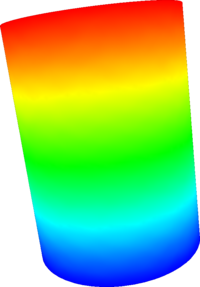 The values of all selected vertices will be rounded to the closest integers by the solver, forcing some harmonic iso-lines to pass through the selected vertex. Multiple/none or all vertices can be selected. Provided that the CoMISo has been installed and integrated into OpenFlipper as explained above, this step is now very easy. We are grateful for feedback! Please send suggestions, patches, bug reports, questions and comments to David Bommes.